The moment I got married, the reality of moving to the States with my husband became inevitable. And the first thing that entered my mind: I’ll really have to take the NCLEX-RN exam if I wanted to continue practicing my profession in the very near future. But the process will be very long and tedious considering the fact that I’m a foreign nurse graduate. As a beginner, I had no clue on how to start, where to go, what to do. So I started doing some online research, participate in various online nursing forums, and ask friends/nurses who not only had experience with the application, but those who already passed the exam – with the USRN next to their names. I know how confusing the whole process is, and that’s why after going through the whole thing, I decided it was time for me to share and help. 1. Figure out the requirements of the Board of Nursing in the State where you want to be licensed at. You can check your State BON website here. 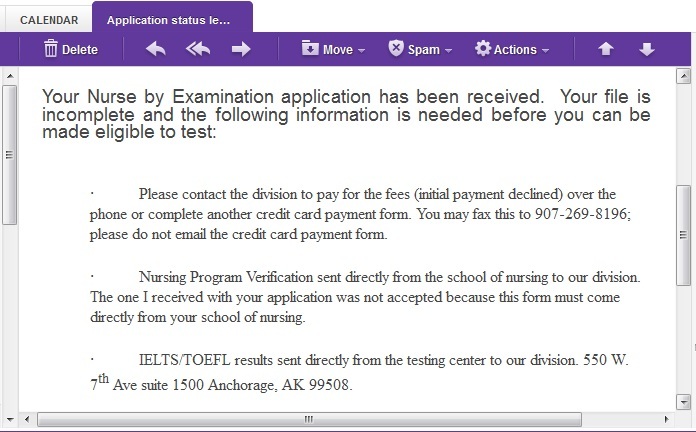 In my case, Alaska BON required from its foreign applicants a valid English exam result, and CGFNS-CES report. It took a long time before I was able to send my actual application to them because I needed to accomplish the CGFNS requirement first. For my IELTS, I actually had to retake it in the middle of my application because my first result was already past its 2-year validity. You can take a look on my IELTS experiences here, here, and here, and my CGFNS-CES processing here. 2. 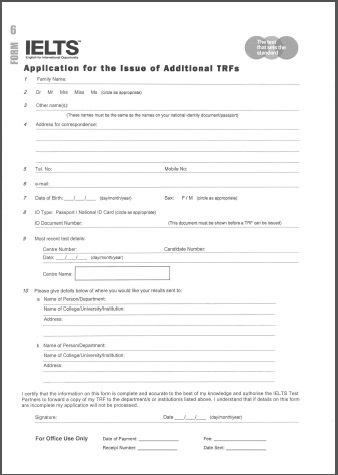 Download and accomplish the application form from the website. Have it signed and notarized. Aside from this, I was also instructed to attach a passport type 2×2 photo taken within the last 6 months. 3. Prepare/submit the appropriate fees. 4. Request for and obtain a Fingerprint card. 5. 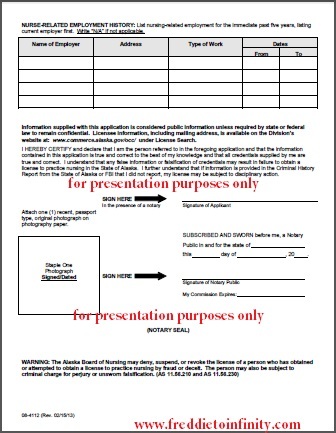 Download the Nursing Program Verification form and submit it to school. For this one I accomplished part 1, then gave it to my school for them to accomplish part 2. Like the CGFNS form, I had to wait for one week before getting it done. 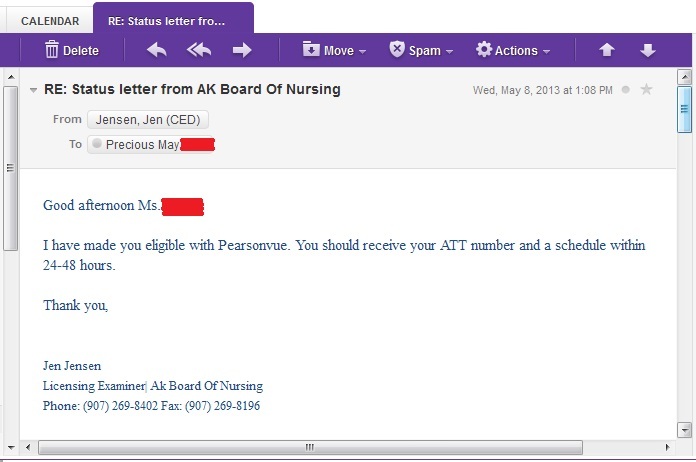 Okay, so you might observe I haven’t sent anything to the Alaska Board of Nursing yet. Sending documents to Alaska isn’t cheap so I wanted to make sure everything is ready so I can put all things in just one big envelope. Aside from the ones mentioned above, I also had a certified copy of my latest IELTS result. 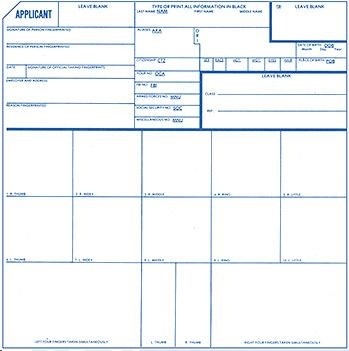 So for this one, the BON requires that applicants have social security number, which I don’t have yet at that time. Luckily, I can fill out this exception form and send it to the authorized office/department. Unluckily too, it’s in a different address so that means I’ll have to mail it separately – another expense. So you also have to make sure that the State where you want to be licensed at does not require SSN, or if they do, they can grant some exemptions like the one I had. Shoot! My money-saving idea didn’t work! Actually, It made me spend even more than I should. 6. Contact the Division to pay the fees. 7. I’m back to step number 5. But this time, after going back and getting the whole thing from school, I went straight to the post office and mailed it. Our local post office also have this Express Mail Service which is just around 2 days slower than Fedex, but more than P400 cheaper. 8. Contact the IDP Australia office for the official IELTS result. For this one, I wasn’t really sure how to start and where to go. So what I did was, I went to the review center, talked to the officers who helped me with my IELTS application, and luckily, they have the form that I needed to accomplish to request my testing center (IDP Australia) to send the AK BON my official results. All in all, I paid them more than P1000 for the processing and the sending of the said document. 9. Wait, wait and wait. So after more than 4 months of waiting (I sent my application early December, but found out I had to retake the IELTS exam because my first result was more than 2 years old already), I received the BON’s approval letter. 10. 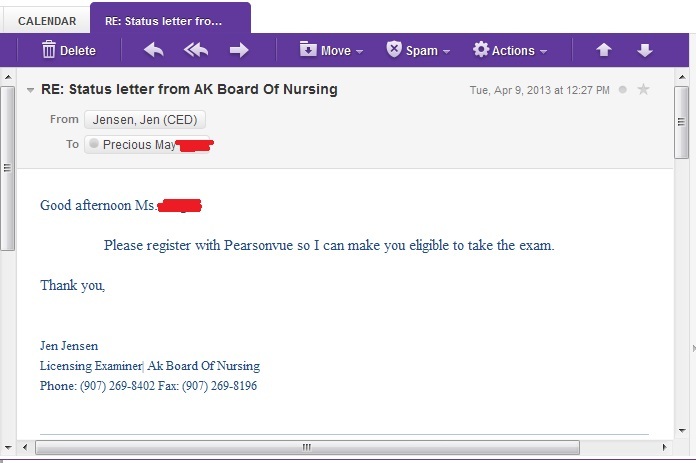 Register with PearsonVue for the NCLEX-RN examination. So by the time I was already in Alaska, I started with the PearsonVue registration. After clicking the credit (debit) card option, I started making an account (the registration process). Here, personal and contact infos, as well as CGFNS certification number and educational infos were needed. For the nursing program code, just type Philippines and click search. I found out that many applicants had some problems with this part, because they add their city/province at the blank area below the country, and that’s what makes the error response. Just leave the “City” as is – blank. After this, select Philippines with program code 99-425 from the list of items, and then proceed with the payment details. Nclex-RN exam fee was $200. 11. Receive your Authorization to Test Letter. Minutes later, the official ATT! You should note that the validity of my ATT is from May 9, 2013 to May 9, 2014. However, the approval letter that I got from the BON (step no. 9) gave the specific instructions for me to take the exam within 1 year from April 9, 2013. That means, I can only schedule and take my exam until April 9, 2014 which makes my ATT ultimately and really valid for just 11 months. You’ll also have to make the same adjustment for your exam schedule. ALSO, be aware of the ATT validity in your chosen state. It usually varies from 60 days to 365 days (I’m lucky that’s mine), usually 90 days – also based from what my friends tell me. So you have to make sure that you are intellectually ready to take the exam before registering with the PearsonVue because you get to receive your ATT almost right away where you are only given 24-48hours to schedule your exam. 12. 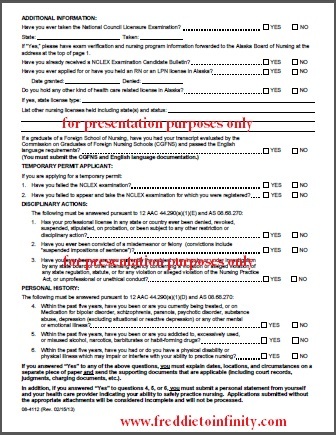 Finally, schedule your NCLEX-RN exam. Print the ATT because you’ll have to present that on the day of your exam, otherwise you will not be admitted. You’ll be required to reregister and repay another $200 to take the exam. So that’s pretty much the procedure you need to go through to apply for the NCLEX-RN examination! Definitely not something that could be accomplished in a few weeks. But patience always pays off.. After that you’ll only have to worry about reviewing and becoming more confident for that big day! Well anything more you want to know or ask about, please feel free to comment. See you on my next blog! hello. i would like to ask until what time do i have to take the exam after i recieve my eligibility? thanks! THANKS A LOT FOR THIS GREAT POST! how long did it take to you in total? thank you for sharing this =) i would like to know what was your entry for the cgfns certification number? is it the same as the cgfns id number? i hope to hear from you soon for i am planning to register soon. From my initial application up to my eligibility letter receipt — 5 months. But you also need to know that it took longer because I had to retake my IELTS exam, which I would say would’ve shortened my whole application process into less than 4 months..
Hello Mary! If I remember it right, yes – I entered my cgfns id number as my cgfns certification number during the Pearson VUe registration. There was no other number on my CES report other than that, so that’s what I did. Fortunately it worked ^_^ Good luck on your exam! OMG! 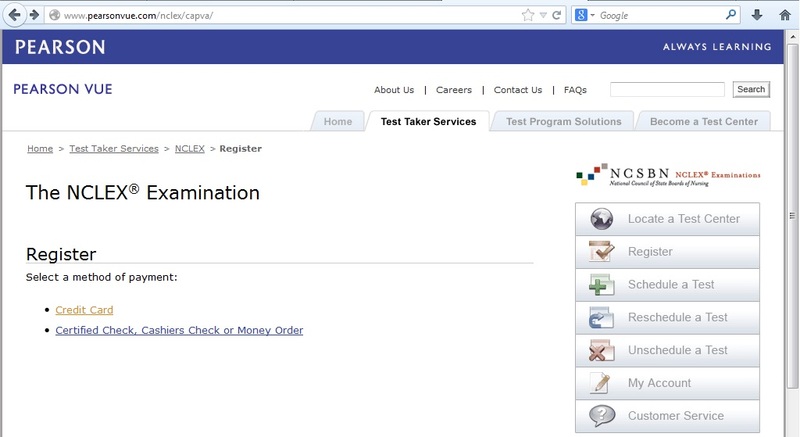 Of all the website, blog and all site I have encountered searching/reading re: NCLEX application, yours is the BEST! Literally step-by-step info with actual pics too. Thank you so much! 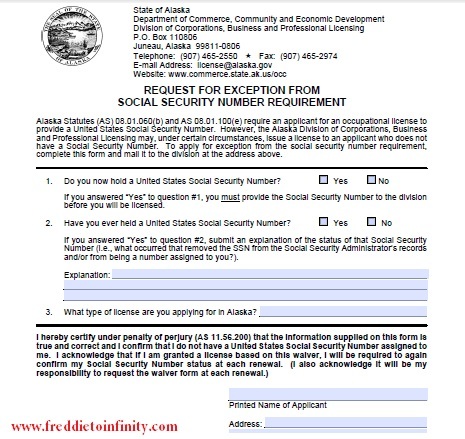 I’m about to start my application, same state as yours, AK. I was hoping to submit the documents before taking my IELS–thanks for letting me know I ahev to take IELS first. Amp. Wish me Luck with my Exams and Applications. hi. I’m trying to register for Pearson Vue. I’m confused about CGFNS Certification number if it’s the same with CGFNS ID number. Light, please. Thanks. Hello Raymund! Browsing through my cgfns report copy, I don’t have any number here aside from my ID number. That’s what I might have written for the certification number..
Hi! I’m confused. Should my academic record be evaluated first by CGFNS before i could take TOEFL?I’m applying in Washington State. Please help. Wow eto na yung simple,practical and tested guide para sa goals ko! Actually tung blog mo ang magiging guide ko. Nakapag-request na ako ng list of requirements from a state and same lang din sa AK. ‘Kala ko talaga exam nanaman yung cgfns. CES report din ang hinihingi nila. At the moment,nagse-save up na ako para sa IELTS and review. Ask ko lang din, General type ba yung IELTS na kukunin? Di yung academic. thanks for the info. 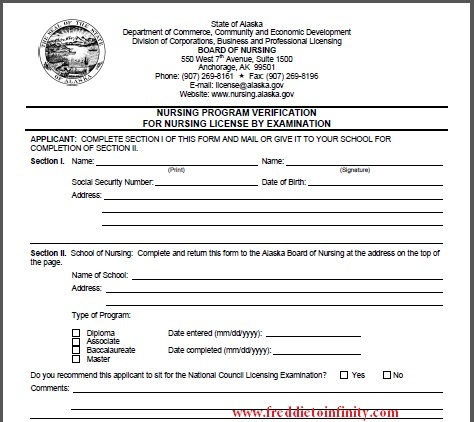 i would like to ask on the procesa of renewing a nursing license in alaska? 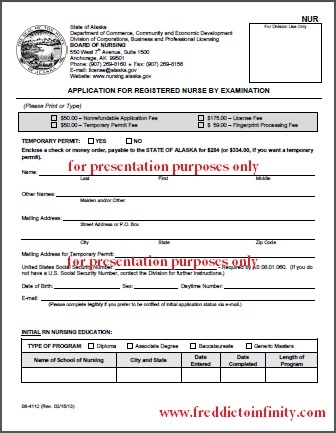 is everyone entitled to submit CEUs and certificate of nursing experience? or it is just random audit by the board? meaning only those individuals who are selected are the only ones to show proof? 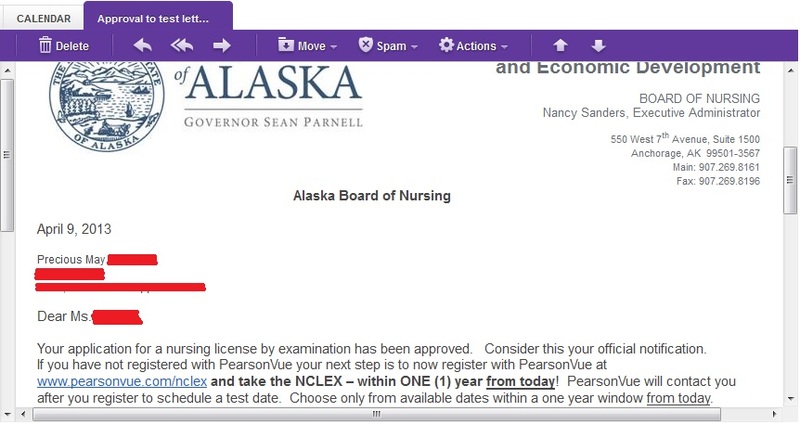 Hello, I am planning to apply in Alaska for nclex. I just want to ask about the “Nursing Verification form”, what did you do in the 2nd time? As I understand, binigay sayo after the school completed the 2nd part and then you mailed it to Alaska. For the 2nd time, how did you do it? Hi, Ms. P-may! How long will i wait for the cgfns to respond? They have received my docu yesterday and i’m waiting for them to respond. By the way thanks a lot for the infos! Finally! Finally!Finally! I’ve fin’lly found the systematic explanation and very informative blog! Hi. I am so sorry for my previous question. I just saw your other blog about your CES application. 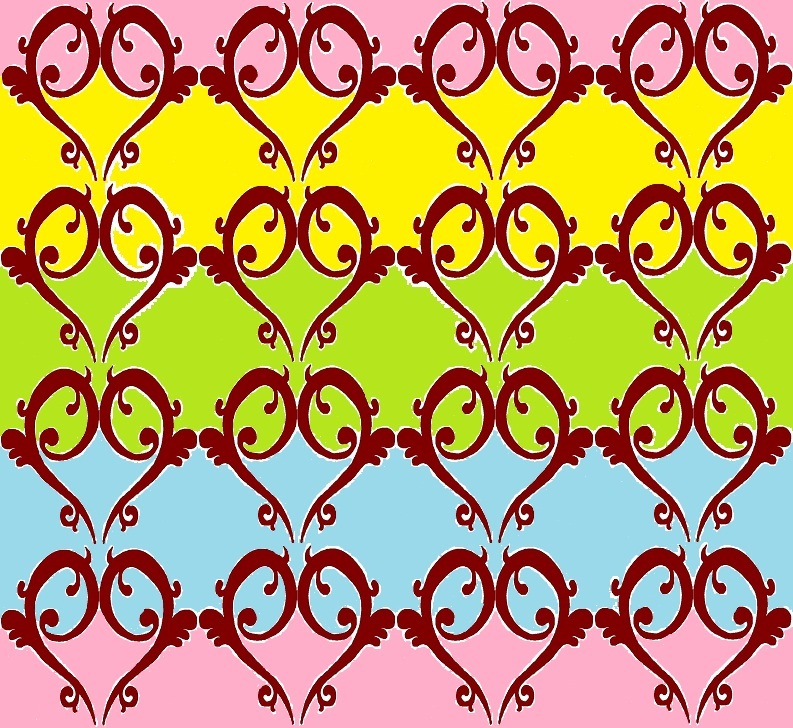 Thank you so much for your blog. Hello. I am a filipino nurse and will leave the country soon and work in Ireland. I’m planning to take nclex soon probably in London. 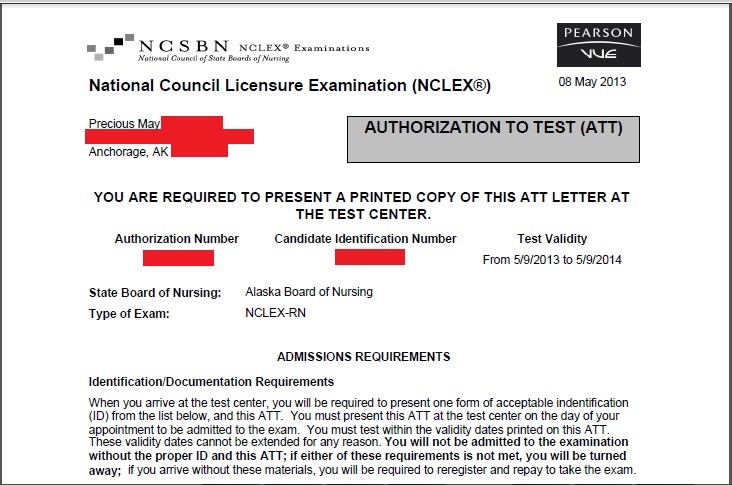 Ask ko lang if possible na makapag applu ako ng nclex although wala ako sa philippines? Mas mahirap po ba ang process? Thanks a lot. Hi P-May, Rye here again I would like to ask if you were asked to provide a Visascreen certificate before you could work in the US? is it still required even with spouse visa? thanks in advance P-May. I’m currently on the first 2 steps in processing for CES. I have already submitted the forms in schools and in PRC. Still have to pay for the fees indicated by CGFNS for the background checking. Will it be more efficient if I’d send the requirements you indicated in bulk so that I can save more? The school papers have to be sent directly by the school and so are the PRC papers because it’s an office to office transaction. Hi, I would like to know how you requested the fingerprint card packet? I contacted the Nevada BRN through their website and email asking for the fingerprint card but they did not reply. I have recently received mail from the BON where I applied stating that I passed the NCLEX. I need to secure a US SSN before I can have the license number. Is it possible that I do endorsement to Texas BON even if I don’t have my actual license number yet? 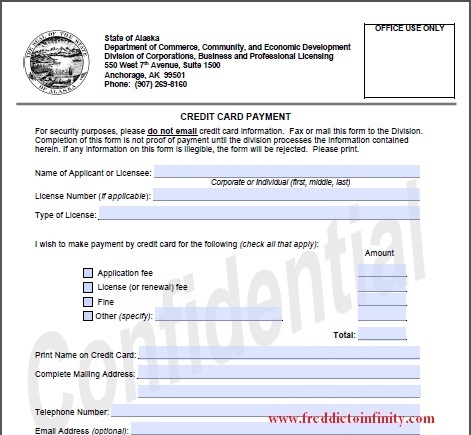 Hello P-May, Just read your blog, I’m just wondering if the BON of Alaska also did verification of your PRC license as you don’t mentioned it in any of the steps. I’m asking due to the fact that I have two licenses , 1 in PH and 1 in KSA and I might be having a dilemma for verification of my license in KSA as i’m not already there once i lodge my NCLEX application for AK. Thanks. Hi Ther, if I remember it right, it was the CGFNS that had to verify my existing license, not BON. I think you did it right, try calling their number to get update. I got mine through the mail. Hi Sarah, I would say you have to secure your SSN first as instructed, then be able to endorse it to Texas. Try calling Texas BON for verification. Did you do your fingerprinting at the main NBI branch or a satellite office? Regarding the physical fingerprint card do I have to fill up the information by pen or the NBI will have it printed? What field should i leave blank? Did you write down your ALIASES AKA too?